Young Tomek (Olaf Lubaszenko) works as a post office clerk and is obsessed by Magda (Grazyna Szapolowska), the woman who lives across the courtyard from him in a Warsaw housing estate. Night after night he spies on her, watching as she brings home a series of lovers. But eventually she becomes aware of his voyeurism and turns the tables on him, with devastating consequences. A Short Film About Love is an expanded cinema version of the made-for-TV Dekalog VI: Thou Shalt Not Commit Adultery. However, love is the key to this film, whether it’s the maternal love of Tomek’s landlady (Stefania Iwinska) for a man who isn’t actually her son, Magda’s cynical feelings after one too many bad relationships, or Tomek’s falling for the woman he is spying on. The ending is different to that of the TV version, but it works beautifully. As with all the other Dekalogs, Kieslowski worked closely with his co-writer Krzysztof Piesiewicz, and his composer Zbigniew Preisner, all of whose contributions are vital to the film’s effect. Cinematographer this time round was Witold Adamek. This Short Film… looks much more realistic than the previous one did, but even so considering that it was shot in 16mm with a budget that allowed for only two takes of each shot, it looks remarkably good. A Short Film About Love is superbly directed and acted. 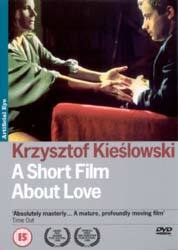 It’s one of Kieslowski’s finest achievements. After Dekalog, Kieslowski moved into the world of international co-productions with The Double Life Of Véronique and The Three Colours trilogy. All of these are the work of a great director, but one who never surpassed this modestly budgeted series of films that he made on a minuscule budget for television. The DVD has an anamorphic picture in the original 1.66:1 ratio. The Polish-language soundtrack is in Dolby digital 2.0 mono, with optional English subtitles. Extras: introduction by Annette Insdorf, interviews with Grazyna Szapolowska and assistant director Emmanuel Finkiel, the early Kieslowski short film Tramway, the trailer, and Kieslowski filmography.